Preorder DVD on Amazon now! Available for streaming on www.valoroustv.com. DVD with 40 minutes of bonus material in retail stores Spring 2019. 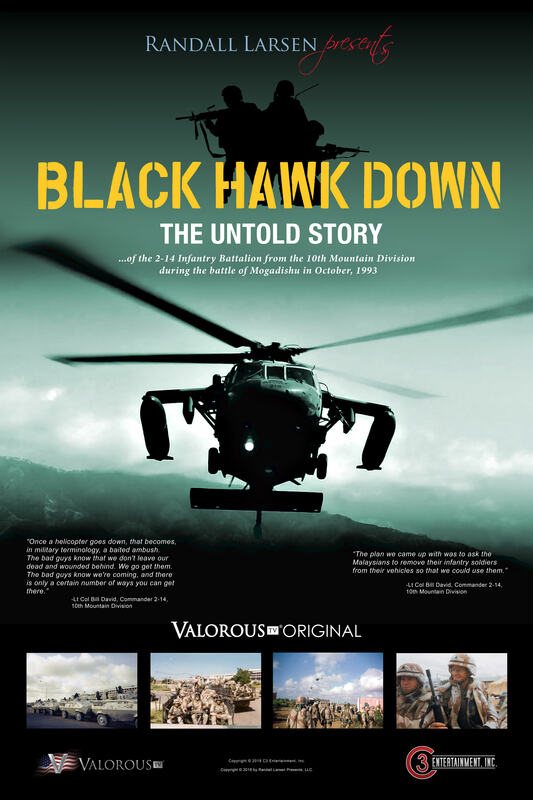 Black Hawk Down: The Untold Story is a documentary film on the heroic efforts of the soldiers from the 2nd Battalion 14th Infantry Regiment, 10th Mountain Division (2-14). These men demonstrated extraordinary courage, skill, and discipline as they fought their way into a “baited ambush” to rescue the special operations forces pinned down at the crash site of Super Six-One while also attempting a rescue at the crash site of Super Six-Four. Two soldiers from the 2-14 were killed and eighteen wounded in what many have described as the most ferocious urban combat since the Battle for Huế during the Tet Offensive in 1968. Army Times. 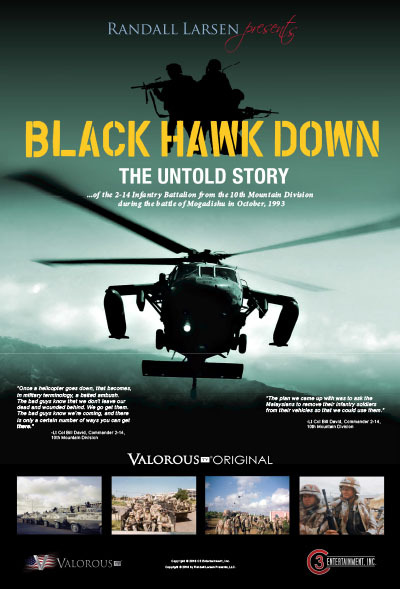 "New ‘Black Hawk Down’ documentary tells story of soldiers who saved Rangers, Delta Force troops" by Todd South, March 30, 2019. Stars and Stripes. 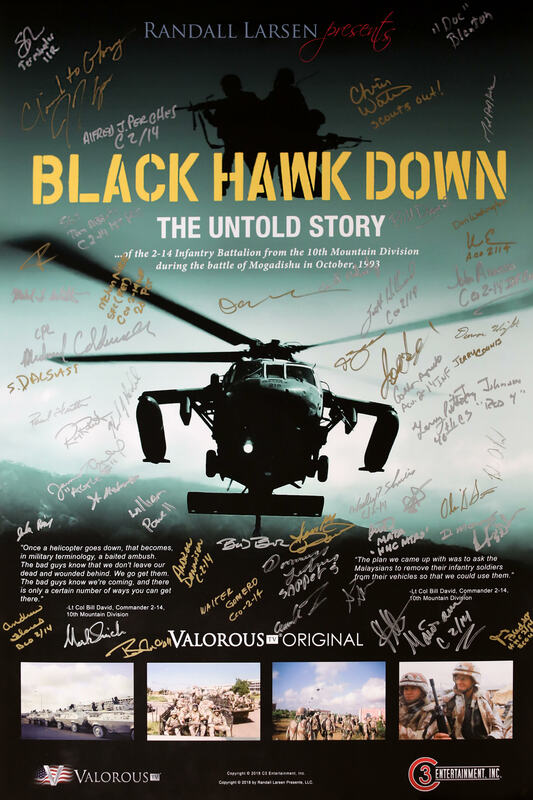 "The Making of Black Hawk Down: The Untold Story" by Craig Fox, Sept. 24, 2018. North Country Public Radio. "25 years after Black Hawk Down, new documentary tells the 10th Mountain Division's story" by Sarah Harris, November 8, 2018. Operation Whitecoat tells the story of these patriots–their commitment to both their religious principles and desire to serve in America's defense, their courage to participate in these tests, and their contributions that went far beyond Army biodefense. More about the movie can be found at operationwhitecoatmovie.com. An award-winning NSPYR • GoodBlood short documentary film about the extraordinary sacrifice and inspiring resilience of brave American men and women in uniform who have served in Iraq and Afghanistan since 9/11, been wounded, and are role models of the human capacity to overcome adversity. It premiered at the Newseum in DC and screened at film festivals around the country. Dr. Lewis Rubinson talks about his experiences during the summer of 2014 at Kenema Government Hospital in Sierra Leone. The physician he replaced had been infected with Ebola and evacuated. More than 20 nurses had been infected, and 15 had died. Dr. Rubinson talks about the challenges and low-cost solutions that could have saved many lives. This film is being presented at a series of CDC-funded Ebola workshops in Texas. These four videos, filmed in 2013, were featured at the November 4, 2016 memorial ceremony for Dr. D. A. Henderson. D. A. served for 10 years as the Director of the World Health Organization’s global smallpox eradication campaign. Smallpox, a lethal and contagious disease, killed more than 300 million people during the 20th century, but not one since 1980. Smallpox is the only human disease eradicated, and no single individual played a more important role in the eradication program--an effort many consider to be one of the greatest accomplishments of the human race. Faster Vaccines asks why America is using 50-year old technology to produce important vaccines. Produced by the Congressional Commission on the Prevention of Weapons of Mass Destruction Proliferation and Terrorism in 2009. Senator Daschle recalls his experiences on 9/11 and a few weeks later when he received an anthrax letter. An interview with two of America’s leading experts on biodefense. This documentary played on 223 PBS stations in the fall of 2013. Randall Larsen is the CEO of Randall Larsen Presents, a company dedicated to bringing great stories in film and print to the American public. He also serves as the National Security Advisor at the Johns Hopkins Center for Health Security and a member of the Council on Foreign Relations. Larsen is the author of Our Own Worst Enemy: Asking the Right Questions About Security to Protect You, Your Family, and America (Grand Central, 2007). His articles have appeared in the Washington Post, Wall Street Journal, USA Today, and Business Week. Colonel Larsen retired in July 2000 after serving in both the Army and Air Force for a combined total of 32 years of active duty military service. His flying career began as a 19-year old Cobra pilot in the 101st Airborne Division. He flew 400 combat missions in Vietnam. He is a command pilot with more than 4,000 hours and also served as military attaché at the US Embassy in Bangkok, the chief of legislative liaison at the US Transportation Command, and the commander of America’s fleet of VIP aircraft at Andrews AFB MD. His decorations include the Legion of Merit, Distinguished Flying Cross, Bronze Star, 17 awards of the Air Medal (3 with “V” Device for Valor), and the South Vietnamese Cross of Gallantry. Direct any inquiries about Randall Larsen Presents to info@randalllarsenpresents.com. © Randall Larsen Presents. All rights reserved.